How do you slow down Hayden? Any of the above answers are acceptable but on this particular day, we are going with a) Broken foot. Hayden jumped out of a tree. Well the actually the ground won. She went all in too and got her money's worth. She broke the second, third, fourth and fifth metatarsal bones. She's in a splint until the swelling goes down and then a cast early next week. It's going to be an interesting weekend because she is supposed to keep weight off her foot so that should be fun to try and keep her still. 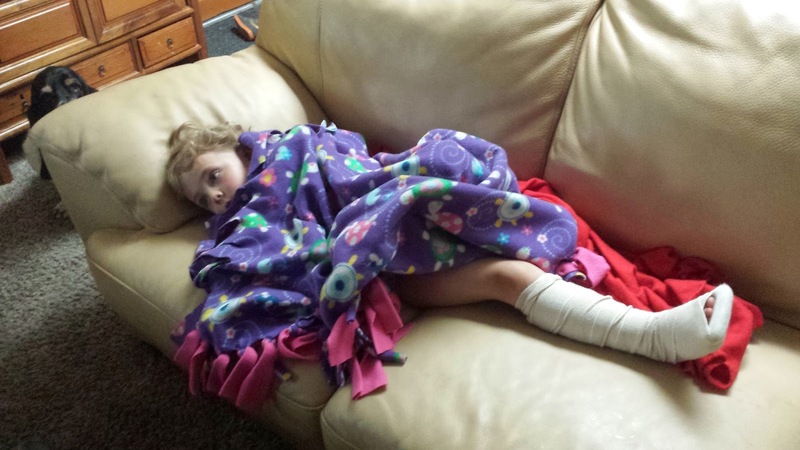 Plus she will not be able to do her swim lessons or gymnastics for at least 4 weeks. And Tanklin had to join in the fun by photo bombing the picture. Ah- Gibson broke his leg last summer. All survived. Hayden will too. That's some fracture, but she'll soon be bragging about it. Never a dull moment with kids, eh? Ouch. That's not the best way to start the summer. Actually, I think there's an episode of The Simpsons that starts that way. Hope she does better. Oh, no! I hope it heals quickly. I was going to say what Jon did :) Oh you do have a handful with that cute little girl of yours. Good grief! Give her hugs from Aunt Kathy and Uncle Jeff. ouch! poor old hayden, next time maybe she'll listen to kyle.